The Parliament of Northern Ireland, known as Stormont Parliament Buildings is a rigorous and formal building, located on a slight hill on the outskirts of East Belfast. It is called Stormont because of its location - Stormont is the name of this part of the capital of Northern Ireland. Today, the parliament is open to the public, and tours can be arranged by appointment. Everybody also has the opportunity to enter the building and watch the debates. In Stormont the government of Northern Ireland was housed until 1972, when it breaks. There currently meets the Northern Ireland Assembly. 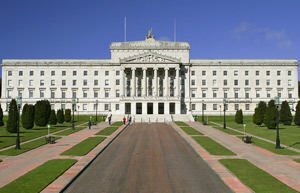 The need for a separate parliament building occurs after creation of the Autonomous Region of Northern Ireland, in 1920. While the building is erected Parliament meets in two places - in Belfast City Hall and in the nearby church. Foundations were laid for the Parliament in 1922. The original architectural plans provided in the east Belfast to appear large central building with a dome and two side wings, which houses three branches of government - legislative, executive and judicial. It also provided to be accommodated the Supreme Court. Of course, the original plans were not fully implemented and the Court ultimately was built in central Belfast. After the building of the Parliament of Northern Ireland was ready in 1932, there appeared a genuine work of architectural art. Stormont looks like a castle with its clean architecture and lavish decorations. Architect of the building is the representative Sir Arnold Thornley. Stormont should look like the Capitol, in Washington DC, which to some extent has been achieved, but with a significant difference. In 1929 the stock market collapse led to economic difficulties and the idea of the central dome is not achieved. Thornley’s classical building was designed with six round columns and a triangular central pediment. Lined with Portland stone and adorned with statues, bas-reliefs and carvings, the Stormont Parliament Buildings have many similarities with many other parliamentary buildings in neoclassical style in different parts of the world. In relation to its interior, Stormont also is not poor. Especially impressive is the Great Hall, which is lavishly decorated with Italian travertine marble. Much of the decor is the work of Italian masters who come here specifically for the decoration of the Parliament in the 20’s of last century. Inside you can see both chambers - the House of Commons and the Senate Chamber. From the center of Belfast, Stormont can be reached in 20 minutes. The building itself covers about 5 acres, and it leads to about 1 mile of straight streets. Around the Houses of Parliament Stormont extends a 300 acre park that is open for public visits up to 19:30 pm.